She's The One is an uptempo rockin' love song that describes the feeling of hitting 'pay dirt,' on that dusty and dry mountain road to passionate, satisfying love. Replete with a killer dobro solo, it'll bring you to your feet! Their EP "Animated." debuted on Americana Radio in the Top Twenty of the Roots Music Report , in both Alt Folk and Folk categories, and finished #118 in the 2015 Top 200 Folk Albums. "I'm Thankful for the Love" was the #1 Alt Folk Single for three weeks, and finished 2015 #68 in the Top 200 Folk Singles. Enough!, a driving rocker a la "Jagged Pill" ended 2015 at #78 in the same list. 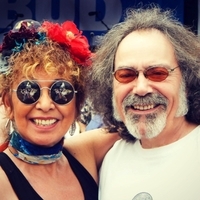 Tapia and Jim's music reflects a blend of folk-rock, jazz and Latin influences, as well as a joyful approach to life's experiences with a "been there/done that and came back for more" attitude. Their 2015 EP "Animated," tells the story of grown-ups who have made mistakes, been redeemed, and learned many lessons the hard way -- sometimes digging in heels all the way down the slopes of change, where, when they land, discover deep rivers of love and satisfaction.